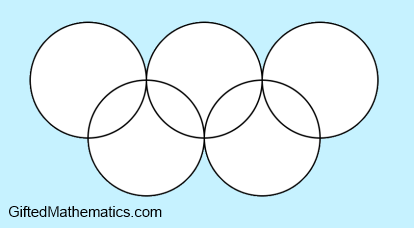 Below is a diagram showing five overlapping circles. Alice is trying to put one of the numbers 1 to 9 inclusive into each of the nine regions in such a way so that each circle has the same total sum and every region has just one number within it. a) Is it possible? If so, how many solutions are there? List the order of the numbers, ignoring reflections in the vertical axis. b) Also, prove that if we use the first nine odd numbers there are no solutions possible.